All-in-one movie centralization and viewing service Movies Anywhere on Tuesday announced a new partnership with FandangoNOW that will allow customers of the on-demand service to watch purchased shows on variety of platforms, including Apple's iOS and Apple TV. FandangoNOW is the latest digital retailer to join the Movies Anywhere stable, which launched last year with support for five major motion picture studios. "We are thrilled to welcome FandangoNOW, a go-to online destination for movie fans, as our newest digital retailer. Movies Anywhere is rapidly revolutionizing the way that consumers access and enjoy their digital movie collections," said Karin Gilford, General Manager at Movies Anywhere. Gilford went on to say the Movies Anywhere app has been used to store more than 100 million movies since its debut. At its core, Movies Anywhere is a content locker for movies produced by Disney, Sony Pictures Entertainment, Twentieth Century Fox Film, Universal Pictures and Warner Bros. Entertainment. The service and corresponding app solve the issue of content fragmentation, or siloing movies to the platform on which they were purchased. For example, without Movies Now, viewers who purchased a Disney film on iTunes would have no choice but to view that movie on an iTunes-compatible device, meaning no native Roku or Amazon Fire TV support. With Movies Anywhere, users can purchase movies produced by one of the five participating studios through Amazon Prime Video, Google Play, iTunes, Vudu, and now FandangoNOW, and watch them on those same platforms or via a standalone app. In addition, the service supports redemption of digital copy codes often found with Blu-ray and DVD disc purchases. Currently, native Movie Anywhere apps are available for Apple TV, iPhone, iPad and iPod touch, Amazon Fire hardware, Android devices, Chromecast and Roku streamers. 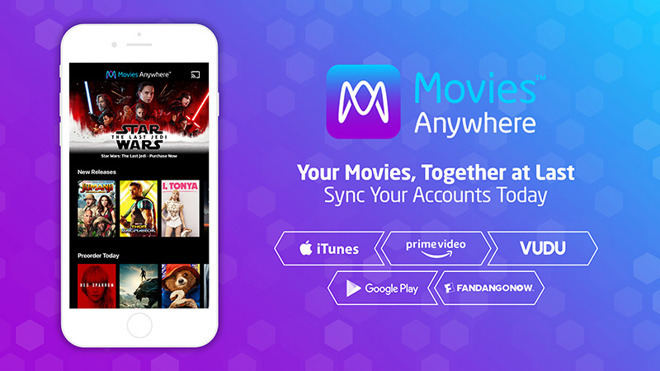 Users simply log in and connect their Movies Anywhere account with their digital retailer account and sync their content libraries to get started. The company is playing up the new FandangoNOW integration by touting access to Star Wars: The Last Jedi, which arrives on digital store shelves today. Users of the service can now choose from a selection of Star Wars themed profile pictures including the Rebel Alliance Starbird, a Stormtrooper or the First Order emblem. Fandango is also taking advantage of the tie-in, as the firm is giving away two free movies when FandangoNOW is the first service connected to a user's Movies Anywhere account. In addition, customers who buy Star Wars: The Last Jedi can get an exclusive score-only version of the film through Movies Anywhere. Both offers are available for a limited time.